Sears Roebuck & Co. was a big part of my extended family at one time. My wife’s grandfather started in the mail room and worked his way up to executive, through the introduction of computers and the firebombing in Caracas. Sadly, its demise appears imminent. I find the positive loops including Morale and Attrition unsettling. 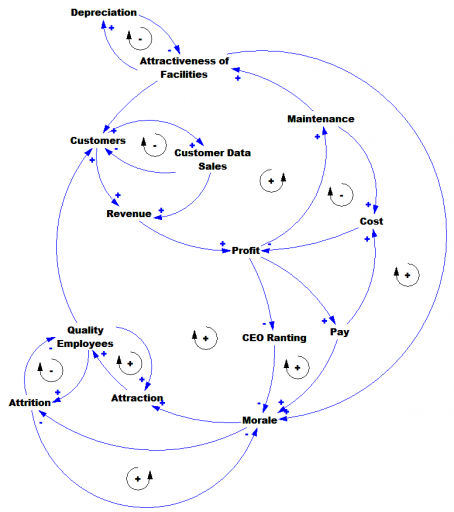 The negative effect of Attrition on Morale makes them negative loops. The positive effect of Morale on Attrition feels wrong. A typo? Or should Attrition be replaced by Retention (with no change in the polarity around it because increase in Retention could slow the increase in Quality Employees if their quality was adequate)? Good catch! The link from morale to attrition should be negative. So, the story is, low morale increases attrition. As employees observe their colleagues fleeing the sinking ship, their morale plummets further. I’ll fix it as soon as I’m back from a trip. Previous Previous post: Privatizing Public Lands – Claim your 0.3 acres now!